Spring Steel Axle Set. Requires drilling hole in your main gear to 1/4". Includes 2 axles, 2 nylock nuts. 3/8" wrench to hold axle, 7/16 wrench to run in securing nut. Threaded portion is .325 long. 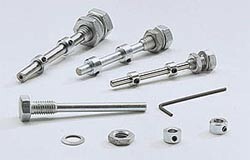 This axle kit contains 2 axles just like the left most axle in sample photo. Spring Steel Axle Set. Requires drilling hole in your main gear to 5/16". Includes 2 axles, 2 nylock nuts. 7/16" wrench to hold axle, 1/2 wrench to run in securing nut. Threaded portion is .325 long. 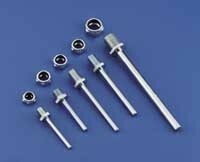 This axle kit contains 2 axles just like the second from left axle in sample photo. Spring Steel Axle Set. Requires drilling hole in your main gear to 5/16". Includes 2 axles, 2 nylock nuts. 7/16" wrench to hold axle, 1/2 wrench to run in securing nut. Threaded portion is .485 long. This axle kit contains 2 axles just like the center most axle in sample photo. Spring Steel Axle Set. 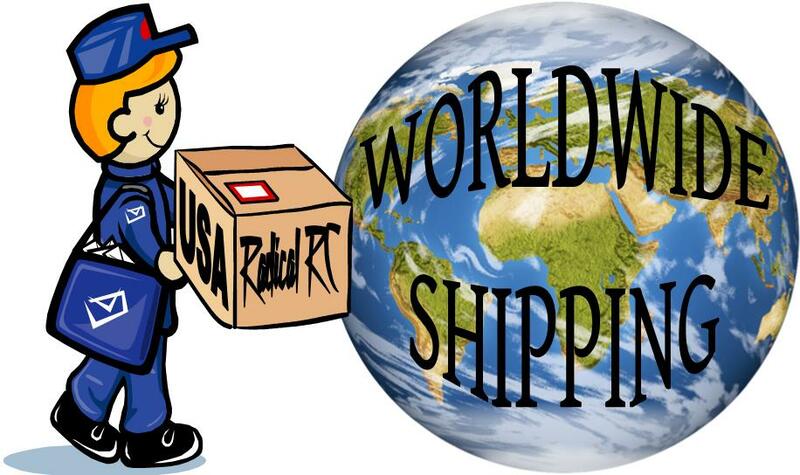 Intended to be installed on your a 5/32 down leg of a nose gear or wing mounted main gear. Includes 2 axles, 2 axle mounts and 4 set screws to lock mount to down leg and axle into mount. Allows height adjustment of axle. This axle kit contains 2 axle assemblies. 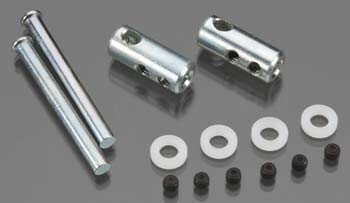 Bolt to any aluminum or fiberglass landing gear. Easy installation: either tap a thread in the landing gear equal to the "mounting thread" size or mount in an untapped hole using the included steel hex nut and lock washer. Since the KAVAN Axle Shafts install from the inside of the landing gear, the removal of wheels (when wheel pants are attached to the landing gear), is much easier. Includes 4 wheel collars and 1 hex wrench. Zinc plated steel. 7mm (letter J or 9/32" bit) mounting hole required. Photo is MFG's of this family of parts, 1 complete set (pair) of axle shafts included. 3/16 Axle with fitting to connect to 3/16" landing gear. 3/16" Titanium/Aluminum Alloy Axle, Weight 20g/0.7oz, Length 67mm. Rated by MFG for aircraft weight to 60lbs. 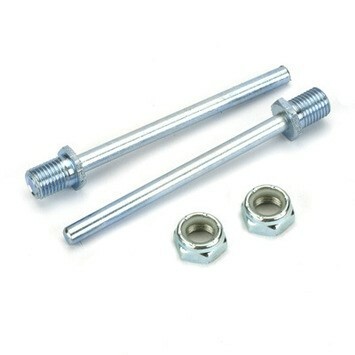 3/16" Steel Axle, Weight 35g/1.3oz, Overall Length 67mm including threaded area. Axle Length up to threaded area 50mm. Spring Steel Axle Set. Bolts to any dural landing gear. Easy installation. Available in four sizes. Comes complete with low profile nylon insert lock nuts. Spring Steel Zinc Plated. Requires 5/16" (8mm) hole to mount in gear. Bolt to any aluminum or fiberglass landing gear. Easy installation: either tap a thread in the landing gear equal to the "mounting thread" size or mount in an untapped hole using the included steel hex nut and lock washer. Since the KAVAN Axle Shafts install from the inside of the landing gear, the removal of wheels (when wheel pants are attached to the landing gear), is much easier. Includes 4 wheel collars and 1 hex wrench. Zinc plated steel. 8mm (letter O bit) mounting hole required. Photo is MFG's of this family of parts, 1 complete set (pair) of axle shafts included. Bolt to any aluminum or fiberglass landing gear. 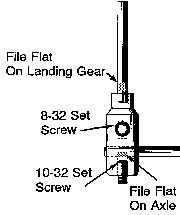 Easy installation: either tap a thread in the landing gear equal to the "mounting thread" size or mount in an untapped hole using the included steel hex nut and lock washer. Since the KAVAN Axle Shafts install from the inside of the landing gear, the removal of wheels (when wheel pants are attached to the landing gear), is much easier. Includes 4 wheel collars and 1 hex wrench. Zinc plated steel. 10mm (letter X bit) mounting hole required. Photo is MFG's of this family of parts, 1 complete set (pair) of axle shafts included. Spring Steel Axle Set. Bolts to any dual landing gear. Easy installation. Available in four sizes. Comes complete with low profile nylon insert lock nuts. Spring Steel Zinc Plated. Requires 7/16" (11.1mm) hole to mount in gear.